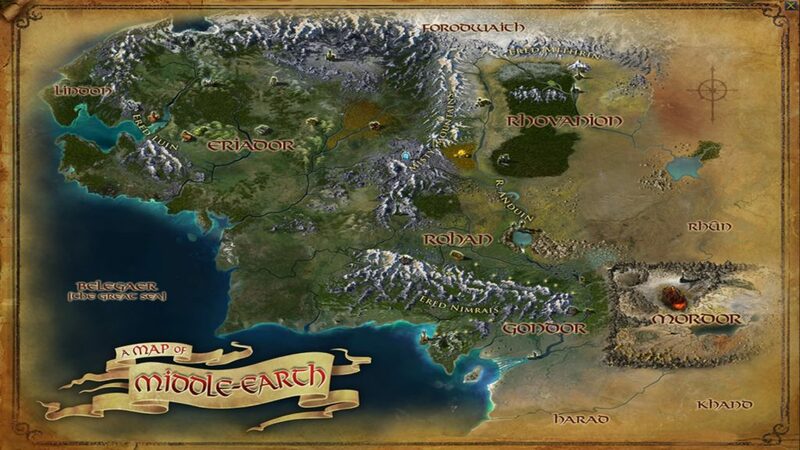 MMOC: We have with us Rob Ciccolini, Executive Producer for Standing Stone Games in charge of DDO and LotRO. Also in the room to make sure we don’t misbehave and ask the wrong questions, we have Mr. Jerry Snook, aka Cordovan, Community Manager for both games. So, I’m going to start with DDO stuff. MMOC: So here’s my question. You guys just announced the preorders for Sharn. MMOC: Masterminds of Sharn. How’s that going for you? Ciccolini: Fantastic. So there’s been a lot of excitement over it and it’s been doing very well. The servers are up, a lot of people are in playing Tiefling, and a lot of people are in playing the Inquisitor tree. There’s a lot in it and being able to fire a crossbow in each hand is pretty cool. MMOC: Dual-wielding crossbows sound pretty cool. I built a character that’s a paladin/rogue/artificer… no, paladin/ranger/artificer to be able to conjure bolts and use crossbow, but if I could do dual-wielding crossbows, that sounds pretty badass, I have to say. Ciccolini: It’s also nice because the conceit is that you know how to modify light crossbows and so you equip a light crossbow and it just works if you had one in each hand. But it gives a use for light crossbows and heavy crossbows, which had gotten overshadowed by great crossbows and repeaters for mechanic artificer. MMOC: And you’d mentioned the Tieflings, and they’re playable right now in-game. Now, I did actually look at them in Lamannia [the DDO public test server] the first time they went up. Have there been any significant modifications to them since they’ve been on Lamannia? Ciccolini: I think we changed the skin palette to be more inclusive, extra colors, and we may have more horn options. We fixed a lot of the animations too. MMOC: I did notice at the time that you could only do the Tiefling Scoundrel as the iconic class and you had the fiddle or violin variant there and I’m like hmm, that looks kinda familiar because it came over from the other side. Is there the concept of possibly bringing over more musical instruments from the other side on in or is that the basic notion of having the bard class just be able to play the fiddle as an alternate to the lute. 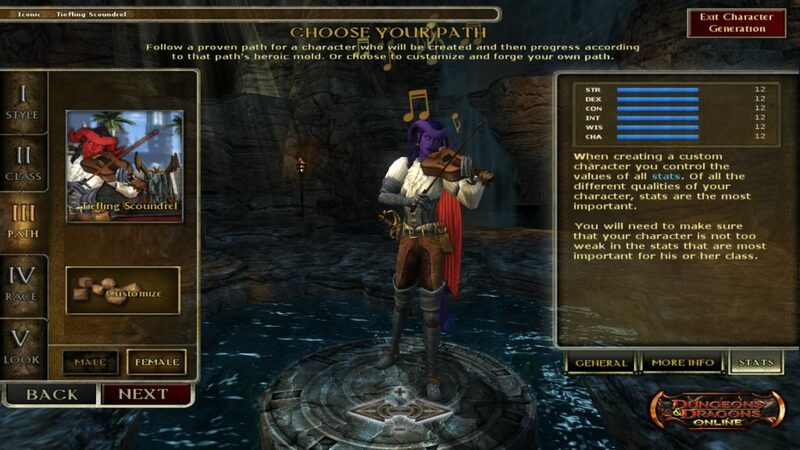 Ciccolini: Attaching the fiddle to the race was something that was special for Tiefling, unlike LotRO‘s rich sort of musical system, DDO does have bards but having alternate animations for various instruments is something that would be cool, but not something that we have plans for. The fiddle was iconic for a character of that bent, so we wanted to go with that in terms of that. And that was all animated fresh, so if it looks like the LotRO one, I think that’s just because, well, there’s only so many ways you can play the fiddle. MMOC: Unless you get very creative. Now, one of the things you mentioned in your Producer’s Letter was that there was a new racial variant incoming. Can you give us maybe a little bit of a hint where that might be going? Ciccolini: So, it’s gonna be Drow. But we’re second-guessing whether we want that to be the next one or something different. That’s why we don’t want to say. MMOC: A variant on Drow? Ciccolini: Yeah, we have a current Drow that is the Khorvaire Drow, it’s the race from Eberron. We might want to do a Forgotten Realms treatise on it that would be different. There’s some devs on the team who are like, “Well, instead we should do this other race…”, so we’ve been waffling on it. So that’s the only reason why we haven’t mentioned it specifically and me and Cordovan are looking at each other because we don’t know if we’re going to do that one yet. 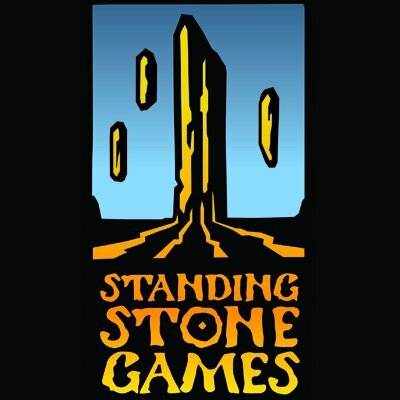 MMOC: So, definitely we’re going to make sure that we’re very clear that it’s not set in… Standing Stone, as it were. Snook: Yeah, it’s under discussion, we have a couple of options. We lean one way, then we lean another way, and we’ll see where we end up there. Ciccolini: Right. The art team has been so busy with Sharn that I would like more input from them about what they’re excited about before I make a commitment. MMOC: I know a lot of the community is really excited about the key art that you have with the various classes that are represented… and guy on flying disc. That was pretty cool. It was like, “Oh, I want that weapon…” Are players going to get that weapon? Ciccolini: I don’t remember the art of the weapon specifically, but they will get to do the flying disc thing. The content with the flying discs is really cool! It’s really cool, so being able to fight in 3D space and flying around on the flying discs for a specific dungeon is like one of the things that I think will stand out in the sheer terms of it, the coolness of the tower areas and some of the landscape. MMOC: It’s definitely a change, going vertically in a space. I think DDO players aren’t used to that. Us LotRO players are well aware of falling through things in Moria. Another thing you mentioned in the Producer’s Letter was a new class in the works. Not getting really in-depth about it, can you give us any kind of hint, what kind of playstyle it is? Is it geared for something like melee, ranged, heals? Ciccolini: Probably end of year. It will be a utility/casting type class? Ciccolini: I would not be surprised if it was a class that made use of all sorts of gadgets and magical things like filters and bottles and other such things. MMOC: Filters and bottles and other such things. Sounds like the name of a band or something. Before we shift into the LotRO stuff, we’re gonna touch on it a little bit. We all know that LotRO is coming out with their 64-bit client. We’re gonna ask about that in a minute. But people have been asking, I know it came up I believe in the anniversary stream or one of [Cordovan’s] other streams recently, people have been wondering, if it goes well on the LotRO side, is that something going in for the DDO side as well? MMOC: Yeah, cool. That was easy. All right, speaking of the 64-bit client, let’s shift our focus to Lord of the Rings Online. Do we have a timeline soon…? 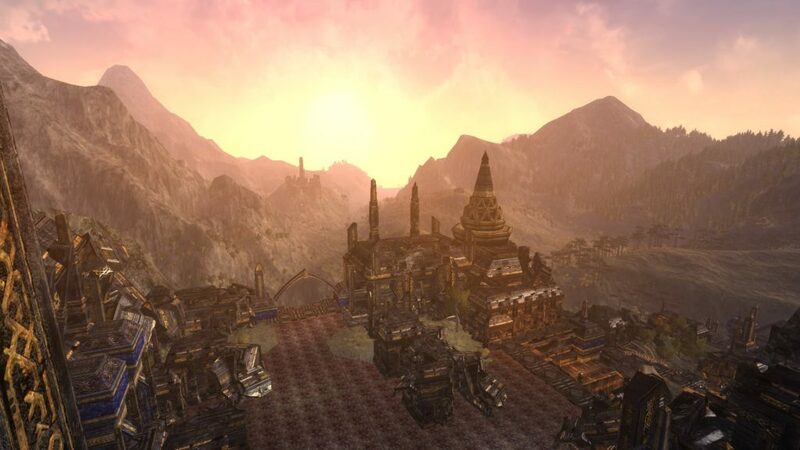 What variant of ‘soon’ are we looking at to seeing the 64-bit client on Bullroarer [LotRO‘s public test server] for the general public to start testing? Ciccolini: It’s on Palantir [LotRO‘s private test server] already, so the closed group is now testing it and QA is going through it. So you should see it on Bullroarer very soon, because we’ll want it to be out, and by very soon, I mean like weeks, not months. MMOC: OK. All right. Shifting into new things that were mentioned in the LotRO Producer’s Letter, you’d mentioned that we’re going into higher tiers of difficulty with the Anvil of Winterstith and whatnot, like T4, T5, etc. I think one of the big concerns I’ve heard from the community is that is it just going to be adding more morale pools to the mobs, add more trash, add more adds here? Are there going to be additional mechanics beyond spawning some more adds to make it more difficult here? Because we have obviously our competitive raiders are the ones who want to get those special titles. They’re going to want it to be as hard as possible without being impossible, but they don’t want just the same but more of the same. Ciccolini: There isn’t anyone who thinks that adding health and damage directly and that being the only reason that it’s more difficult would be compelling. So, we’re going to be adding more mechanics, we’ve been playing with some things, and we still have a lot of iteration but right now, certain creatures, we think we’re going to have a mechanic where they can be imbued by the Shadow of Sauron, and they’ll get additional abilities or specific resistances or something that you’ll have to change your playstyle around. For instance, if you kill one and it buffs all the other creatures, then that’s something you’ll have to kill last. And if another one does a lot of damage, that’s something you probably want to kill first or at least stun. So, there will be different creatures, but the array of powers will be dependent upon tech, a lot of it. Because randomly spawning other elites within the content is something that we’re examining now, so I don’t want to say too much unless we have to change direction. MMOC: Of course. Speaking of changing some things, you had mentioned in the letter that you were looking at a pass on crafting to make it to where crafted items will be, not as good as instance loot, but will be more on a par where a crafter could legitimately craft stuff that somebody questing on landscape would actually prefer crafted gear versus stuff they get in a drop. Because a lot of times, especially in Gondor for example, somebody’s playing through the landscape and they’re going to get quest drops and whatnot, and the crafted items on that same level as not as good or anywhere near as good. So that makes crafting not worth the time or effort on lower levels. Ciccolini: The trick is, you don’t want crafting to eclipse all other itemization, but you also don’t want crafting to be bad, because then there’s no reason to do it. So, what will probably happen is that there will be some really good items in certain slots that crafters can do really well with. So maybe your, as an example, maybe your crafted boots are really good, until you get to Tier 2 or Tier 3 and that way, people on landscape have things they can work to and build certain items, but it doesn’t just invalidate all of the… you’ll still need gloves, you’ll still need a chestpiece. I don’t know yet which slots will line up where, what can be crafted, because that’s something systems is going to be doing, and I don’t want to tie their hands by making those decisions by announcing to the players what will happen. But that’s the sort of thing we’ll be looking for, can we craft that, can we craft some fun items that players may want? And can we craft, can we incorporate essences in crafting somehow? MMOC: Yeah, essences have been a controversial subject. I’ve heard folks on the legendary servers say, “Take essences out, they’re making things too easy.” Another thing about crafting, in my own personal research on the subject, I found out that most of the decent, better than average crafting recipes in Siege of Mirkwood up to the end of the Rohan content, most of the really good crafting items including the consumables for like Cooks were all rep-gated in that your character getting the recipe, bartering for the recipe had to be the one that was playing through that content because they’re bind-on-acquire. So, you had to take your crafter into those zones and that’s a relic of the days when your crafter had to level up with the game content, versus now, when you can park your crafter in a starting area and level that crafter just by muling other items from higher end. So, is there any discussion about removing those rep-gates, make them so they’re bind-to-account so you’re not selling them, so you can trade them amongst your… I can send my main into Rohan which has all the rep, get the crafting recipes I need and then send them off to my Woodworker over here. Ciccolini: So this is… let me ask you something. If you were with a group and your main had done a whole bunch of crafting… it doesn’t seem weird to you that your friend, who is a different crafter, can just get everything you’ve been working on because they’ve been feeding their alt? MMOC: Oh, definitely not for leading-edge. I actually kinda liked the way it was done in Mordor and then later on in the Grey Mountains, like the really really good ones, the cyans, were bind-on-acquire and you had to have certain things, but there were lesser ones like landscape quality that you could pick up with just one character. I don’t know what a majority of crafters do, but what a lot of us do is our main alt is going to be Explorer, which means you’re going to be farming your hides from landscape kills and then you mine and you do the forestry thing. So, your actual main adventuring character isn’t crafting, they’re basically a material gatherer. So if they’re the ones who’ve done the actual game content and unlock the rep, they can’t buy any recipes in those areas like Rohan and whatnot that can help their crafting alts, because they’re bound to… bind on acquire. They’re not bound to account. Ciccolini: So, the experience you are describing is exactly what we want to be careful for. So if somebody wants to play a dwarf blacksmith, and you tell them, “No, no, no, that’s not the right way to play. Your main dwarf has to have all the gathering skills and you just feed them to your alt.” That basically defines that there’s a wrong way to play and that takes crafting out of the context of active gameplay. I’m not sure that’s a good thing. I don’t mind when old content becomes less relevant and then you move it for ease because you don’t want your main going through old content to grab stuff. But for new content, if you… basically you’ve defined a playstyle that is invalidating the crafting fantasy of the people who actually want to be a blacksmith on their main because that’s no longer the right way to do it. Now, I also don’t want to invalidate crafting on an alt, because that’s super efficient, but how do we give you enough so that crafting on an alt is still valuable but if you’re really a blacksmith on your main, which is less efficient. One of the ways we can do it is by making certain recipes only available to that person. Ciccolini: The other way is to make certain items you make that bind when you create them and then you can pass them. So, the person who is a blacksmith themselves might have a leg up in the content without making it so that if you’re not a blacksmith, you’re forever behind. You also have to be able to obtain that gear otherwise, because then we’re defining it that you have to have crafting on your main, and we don’t want to do that either. MMOC: Right, right. Speaking of older content that is now leading-edge on two servers anyway, Moria is live on the two legendary servers. MMOC: I’m actually a little surprised that the legendary servers are still as populous as they are right now. What’s your experience been with that? Ciccolini: They’re populous. They have not dropped in population very much at all. They have maintained even better than we have imagined, so we’re fantastically happy on that. I think part of it is that everybody is at the same place, so when you gather and want to do the relevant content, everybody is in the same place and group. Even on the server, sometimes it’s hard to find a group sort of at the top end, but here, everyone is concentrated. So, if you really want a group for the Moria instances, and Moria was very popular, maybe some of our best group content other than the most recent stuff. Everyone is there. The other thing is there are some people who do both. They like to do the Moria content or whatever’s releasing on the legendary server and when we come out with new story content they haven’t seen, they jump back on their mains and do it. That also happens, although less than I would expect. MMOC: Yeah, honestly, I was expecting the leading edge to push to the end and get done and go for three months back to the regulars and then come back when Moria came out. I didn’t see that really happening, which is very interesting. MMOC: But it wasn’t like a cliff. Ciccolini: You’re right. It’s not a cliff. A lot of people are playing the legendary server like they did back in the day and are going through and re-experiencing the content. Some is nostalgia, some is re-experiencing the story, and some is just the beauty of the Tolkien world. MMOC: Oh yeah. Speaking of the beauty of the Tolkien world, we’re going to jump to current and future content a little bit. We all know the Vales of Anduin is our next patch, it’s gonna be Update 24. I’ve seen a little bit of it, Scenario showed us a little more polished version of the Carrock than I saw one time when I wandered off the beaten path, found my way into where I wasn’t supposed to be. So, we know just by looking at what’s currently available on the live servers that there are new pets you can acquire that hint that we’re going to Rhosgobel to help Radagast do some things. There’s so much rich history of Lord of the Rings in the Vales of Anduin because that’s where the Ring was lost, that’s where Sméagol found it. And I know there’s a lot of people wondering will we get to see, how strong of a possibility, will we get to see the descendants of Sméagol’s family, the hobbits that lived on the Anduin? Will we get to go back through the Misty Mountains to Eriador? Can you give us any sort of hints? Snook: (laughing) I told ya! Ciccolini: No. So, one of the things I don’t want to do is, I just don’t want to spoil content. This is specifically high story that drives the lore. Ciccolini: It’s not just that, it’s systems that affect gameplay are different. It’s a different kind of immersion. We don’t want to start talking… (pausing) The story needs to be experienced for the first time with no expectation as you play through it. That’s kind of the philosophy, and that’s why I don’t want to reveal anything about it, but I will say this. So the Vale of Anduin has a rich history as you said, and a lot of stuff happened there, and the Vales of Anduin will become important because it will lead… the story will lead us through that area to an expanded, an extended sort of story in that area to how it rolls into our expansion. MMOC: Which is Minas Morgul. MMOC: And Shelob, who is not a human person, or a spirit in human form. And I did see the updated Mordor map which seems to imply that the Lake of Nurn and that, which was the breadbasket of Mordor, because Orcs gotta eat. You did mention actually at GenCon that we… we as in you are going to Khand, which is south of Mordor and that’s another lore point for years after the fall of the Ring, Aragorn and Éomer rode off to war, and there’s so much other story bits that are currently tied into current story that we still have questions about, like what were driving the Easterlings into Dale? Are we getting any sort of resolution to that story? Ciccolini: My intention at GenCon was to explain we have excitement for other areas, that there’s a lot of rich lore for us to explore, not to guarantee that we were going to those areas, although I would love to and all of the story people have talked about the possibility of doing that. I just don’t want that to become a talking point of like, “Oh! When are they doing that?” because that’s an ongoing story. The idea is that the world is very big and rich and even though we have gone through a lot of it, there is so much that we haven’t touched, that there’s a lot of things to bring forth that the story team is excited for. MMOC: Okay, fair enough. Since we’re mentioning systems, one of the things that have been going on since last year was you had hinted that there was going to be new housing and that’s been a weekly mention on a certain stream that happens on Fridays. Fevorah asks every week what’s going on with the housing and there hasn’t been an answer. You had specifically mentioned Rohan housing, and there are players who think, “Well, we’re not going back to Rohan anytime soon, it’s a distance away.” But there is the notion of Rohirric-themed housing, because the men of Rohan came from the North, and these are the areas they came from. Do we have any news on housing work since last year? Ciccolini: Well, you basically just said it. It’s hard to follow up on that without getting too specific. Ciccolini: So, we’re going to be looking at new housing… probably right after the expansion, in which case we’re looking at Rohan housing around the time… before Rohan comes to the legendary servers. Ciccolini: So, the timing is fortunate because it’s kind of where it works out. And that won’t be the last housing. I know the players are looking for housing all over the place. Ciccolini: Of course he did. The problem with that is he’s interested in adding like 500 more new instruments. MMOC: He wants to add an entire orchestra, I can’t fault him for that. Actually, this is more of an animation question, because when we were out at lunch earlier, another game basically refers to LotRO as, “Yeah, we got the idea for our music system because LotRO‘s really awesome music system!”, but the only thing they have but we don’t have is the ability to move while playing instruments. Is that something the team has considered or has begun any kind of work on… possibly? Snook: I know it’s a definite ‘no’ on the latter of that, but has it been considered? I don’t know. Ciccolini: I don’t think it’s on the radar as stuff we were planning on doing. I think most of the bands have… unless you want your front man to be wandering around the stage when you’re playing. MMOC: The words ‘marching band’ came into the conversations I’ve heard amongst the music community. Imagine a marching band through Bree. Ciccolini: I don’t know that we want to have the ability for players to follow someone playing music. That doesn’t mean that we won’t, but one of the things we have to consider is how would players abuse this? How will they take our tech and use it for evil? MMOC: (deadpan) Players never use your technology for evil, Severlin, you know that. Ciccolini: So, that is one of the things we consider in terms of what we do. Now, is that realistic? Would they do that? Ciccolini: Right. Like following someone. MMOC: I don’t know anything about using your technology for evil, leading your community manager to the pretty death statues in Angmar or anything. That did happen. But there are a couple of changes that were mentioned in the Producer’s Letter, one that I’m very curious about, mainly because the implication from the notes in the letter reminded me of the other game, of course, which was kinship changes and the notion of possibly kinship ranks. For those who aren’t familiar with the DDO system, your guild over there can earn rank by doing quest content and using particular potions to increase and then you can get certain things or abilities you can unlock or purchase or buy with currency of either kind. Can you give us any sort of information as to the kinship changes you are considering. Are they similar to the DDO system or is this something different? Ciccolini: So, systems got together and did the initial brainstorm for the kinship things that you could earn while something else was going on where I had to be an executive producer, so I didn’t sit in on the meeting. It’s something I’m going to be reviewing once they get further, but right now, we’re working on the virtue update, so the kinship stuff won’t start until the virtue stuff is done. I haven’t reviewed that, so I don’t have your answer, I apologize. MMOC: That’s okay. I think one of the other things was… I was talking to Vastin earlier, reiterated the stuff he was currently working on, which was the Rune-Keeper and the Captain. I saw the spreadsheet, with the numbers on it, had no idea what they meant, I’m not the theorycrafter like Chromite is. Do you think we’re in a good place there? I know there’s a lot of fussing right now about Wardens because they haven’t had a big balance pass recently. Ciccolini: It’s hard because there were a lot of classes that were in better places than others. I mean Warden didn’t get a big balance pass because they were in a much better place than, say, Burglar. Ciccolini: Which needed it. So he’s moving as quick… so what we don’t want to do is, what we don’t want to do is to get into a situation where we spend a long time on each class. What we’d rather do is get into a situation where once he does… so he has to do an initial pass for each to get them ready. Once he does the initial pass, we can make changes to many classes at the same time, because we want to balance the scales a little bit of the time rather than have the pendulum swing. Because nothing’s worse than when you do a lot of buffing, the players are all excited. They realize it’s overpowered but kind of don’t care because… and then you have to pull it back. MMOC: Nobody likes nerfs, unless they involve guns. Ciccolini: So that’s the kind of thing that we’d rather do small changes across the board. We also don’t want to be in a situation where… already people are waiting on their class. So we’d rather do a number of small things so your class gets incrementally better as we rebalance things, so that’s sort of our strategy. It seems it’s class by class right now because Vastin needs to do the initial pass on each one to bring it even in the ballpark in terms of the progressions that it’s using and then we can go into that overall strategy. MMOC: Gotcha. So I think right now the next big thing is of course the anniversary and then Update 24. Since DDO is doing their expansion first, update later this year, we’re doing update first, expansion, ballpark timeframe to expect Update 24? Snook: I think? Something like that? I don’t actually personally know off the top of my head, sorry. Ciccolini: So we just did our 8-week checkpoint, and I think that’s when everyone’s done, so you can expect it like after that, in order to… once it comes together and passes the final stuff. MMOC: And of course, that assumes that it passes, because things can change. Things can break. Ciccolini: Right. Which means… end of June(ish)? I think? Yeah, sometime in later June is probably where you’ll see it, maybe it’ll push into July. Maybe it’ll be mid-June, something like that, depending on how it ramps out. It’s a creative endeavor, you know, like as people develop stuff, sometimes they overreach because the devs are awesome and they try to do as much as they can get in. That’s something that we’ll go through, but that’s the timeframe. I wanted to give you an idea of the timeframe that we’re looking for and realize that it will vary a lot. MMOC: Yeah. Things can change. That’s what whiteboards were invented for, right? Well, do you have anything final that you’d like everybody to know about either Masterminds of Sharn or Update… ooh, what’s the name, is Update 24 actually officially called the Vales of Anduin or is there…? Ciccolini: No, the name needs to be approved. MMOC: So it’s not been finalized. MMOC: Right, yep. It’s better to have it greenlit. Thank you very much for your time. I very much appreciate getting to visit the office and getting to chat with some of my favorite devs on the planet and getting to see all the cool things that they’re working on that I can’t tell anybody about either. Ciccolini: It was great to have you. I’m glad you saw some of the secrets that you can’t talk about. 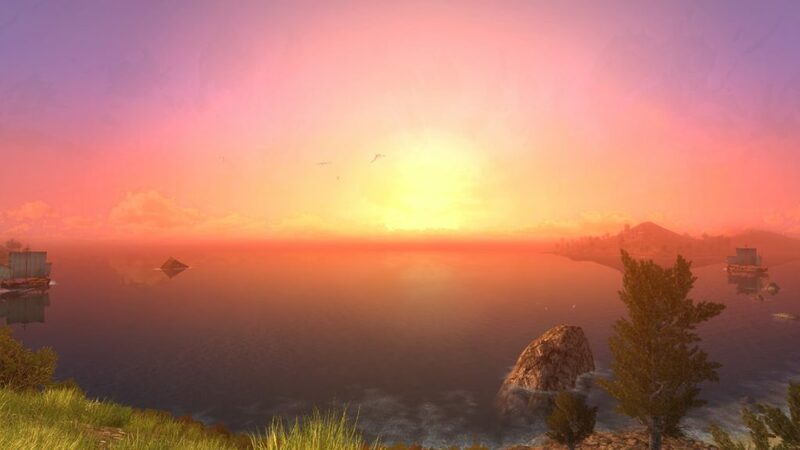 MMOC: One of my favorite things is Vastin showed me the world builder and showed me why Weathertop is such an interesting location to be. 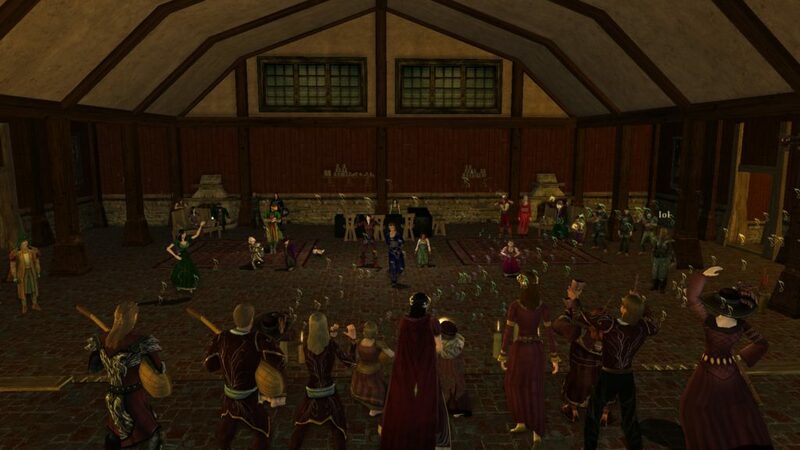 The Lonely Mountain Band breaks it every year because of Weatherstock, but he showed me why it was actually not a good place because of all the other stuff under the hood that makes it easier to break. With the server updates in 2015, it’s been less of a problem. I don’t think we’ve actually crashed the zone since then. We as the music community, I say. Ciccolini: That will help. The server updates certainly helped. I think it’ll be easier on the players with higher-end computers once we have the 64-bit client. We’ll be able to make better use of their system resources, including their graphics memory card, so that will happen as well. MMOC: Cool, hopefully that will be live before the end of July, which is when Weatherstock generally is, generally the last weekend of July, maybe. Ciccolini: Testing will certainly be done. Ciccolini: It depends on what they find. MMOC: Well, if we break it, well, we’ll expect it to be fixed. All right? Well, thank you very much for your time, gentlemen.